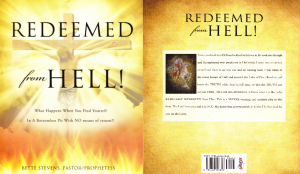 A beloved disciple of Patrick, God has given Bette Stevens a Prophetic Vision for which the Lord has commissioned her to write a book, titled: “REDEEMED FROM HELL”, which is now published and was written as God’s End-Time Plea and Warning to His Remnant and Kingdom People. You may get a free copy by clicking here or by donating if you feel moved to below. Please Donate according to 2 Corinthians 9:7. God bless you.